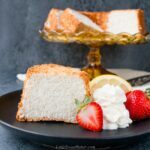 This moist, soft and fluffy angel food cake is a perfect summer dessert. It’s light as air and is essentially fat-free! I hope everyone is having a wonderful summer so far. We are in our second month of summer vacation for the kids, and it’s been one of the best summers I’ve had with them. My oldest has fallen in love with reading. Before it was a chore to get him to read, and now he’s reading chapter books on his own! My youngest loves to draw, do math, and play with Legos. They are even getting along better. I feel like I’m FINALLY winning as a mom. Last week the kids were in soccer camp, so I got a chance to do some baking. It’s been a hot summer, so I thought a light dessert would be fitting for the season. 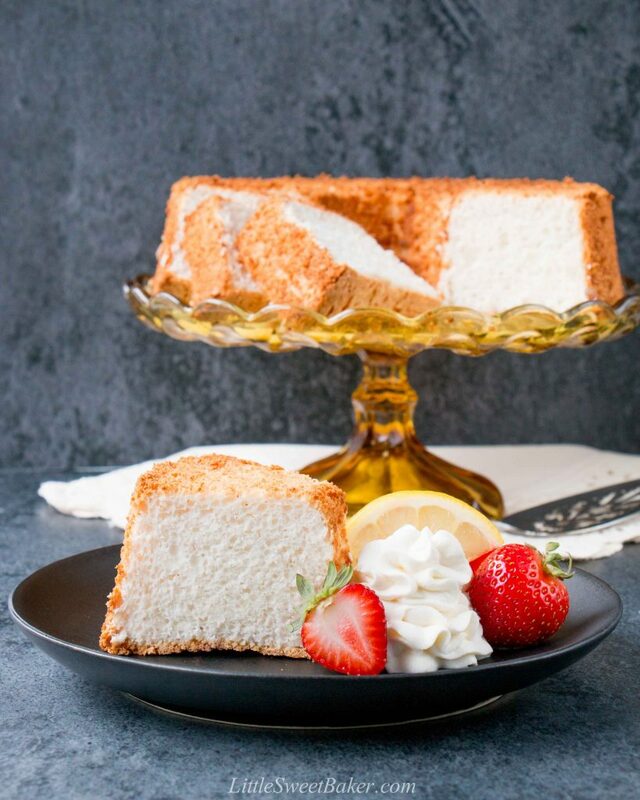 This angel food cake recipe is simple and made without any fat. It’s just egg whites whipped up with some cream of tartar, salt, extracts, and sugar. 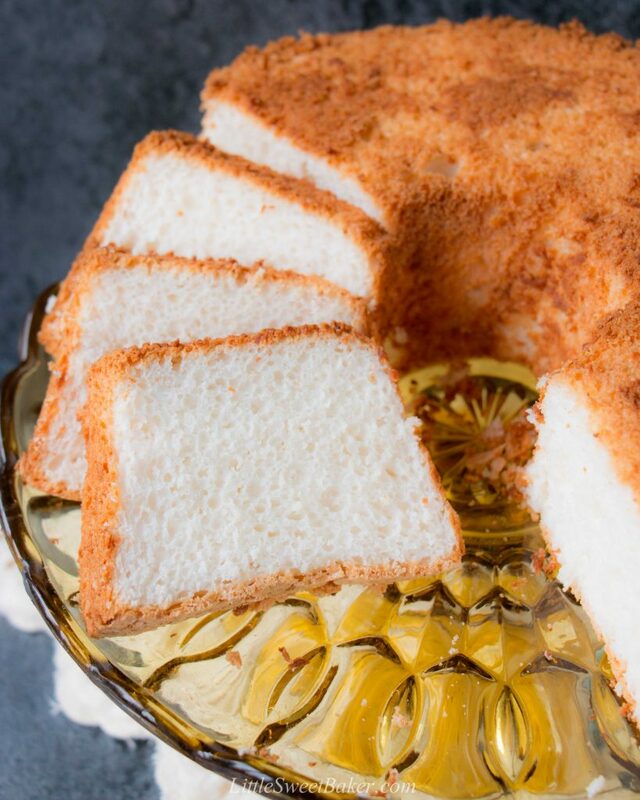 You want to make sure you reach stiff peaks because that’s what gives the cake its structure and rise since there are no leavening agents in an angel food cake. Then you gently fold in some cake flour and sugar, and that’s it. This angel food cake is incredibly light and fluffy like a cloud. It’s sweet and has a spongy texture. 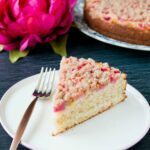 It has a vanilla-sugar scent with an undertone of almond extract. 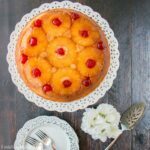 All in all, this cake is simply a perfect light and lovely dessert for summer. Preheat oven to 350F and set aside a 10″ ungreased tube pan. Sift together the cake flour with 1 cup of sugar. Set aside. Place the egg whites in a large mixing bowl, and whip on medium-high speed until frothy. Add the cream of tartar, salt, vanilla and almond extract. Continue to whip until soft peaks. In a very slow, steady stream, add 1/2 cup of the sugar, while continuing to whip until stiff peaks. Sift in the flour mixture, one third at a time, folding after each addition. Transfer the batter into an ungreased 10″ tube pan with removable bottom. Bake for 50-55 minutes or until golden brown and a toothpick inserted into the center comes out clean. Cool cake upside-down, then remove from pan. Slice using a serrated knife.